This ad from a 1970s issue of Woman’s Day is indicative of the way this line was marketed to parents. 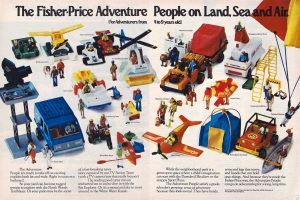 It’s a stark contrast to what we traditionally see in toy ads and commercials, with elaborate dioramas and children setting up their own makeshift landscapes of bedspread mountains and Dixie Cup walls. An infinite white background and simply laid out text is quite compelling nonetheless. The toys sell themselves.